Shea butter has been used as a treatment for stretch marks. Shea butter is derived from the Shea tree. The cream is extracted from the Shea seed and then prepared for use as a cream. Shea better has been used to improve numerous skin conditions over the Years. These conditions include blemishes, eczema, wrinkles, and dermatitis. In addition to diminishing stretch marks, Shea butter has also been used to banish age spots. Shea butter has been used as a treatment for stretch marks. Shea butter is derived from the Shea tree. The cream is extracted from the Shea seed and then prepared for use as a cream. BARE Shea Butter was a well deserved treat for weary and dry skin. Shea butter is amazing at healing eczema, stretch marks & even rough, dry skin. Add in a Coconut Lime Verbena scent that makes you wish it was the middle of a heat wave instead of this polar vortex crap... Well, let's just say that my dry elbows will be ready for summer when it finally comes. 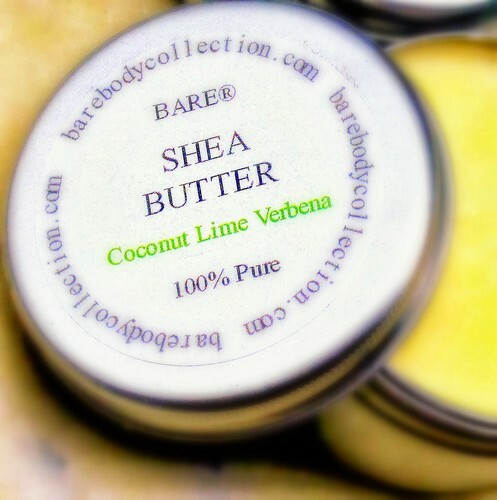 All thanks to this handy dandy tin of Coconut Lime Verbena Shea Butter.